TERMS AND CONDITIONS OF SALEGENERAL TERMS: The auction will be conducted by Iron Bound Solutions LLC. dba Iron Bound Auctions, herein referred as (Auctioneer) on behalf of the owners of the property, referred to as the Seller. Auctioneer is not responsible for the acts or representations of Seller. The auction shall be governed by the terms set forth herein (the agreement), and any additional terms and conditions that are posted concerning the specific property. The Agreement constitutes a valid, binding contract between individuals participating in the auction with the intent to purchase property, referred to as the Bidder or Buyer, and Seller/Auctioneer. The term Bidder or Buyer shall include, but not limited to, the individual or the company represented by the individual and any and all of its agents, employees, representatives, officers, and directors. Auctioneer is not responsible for statements made by the Bidder, Buyer, or other parties. Auctioneer reserves the right to periodically change the terms and conditions of the Agreement, which shall be effective immediately upon posting. It is the Bidders responsibility to review any and all changes made to these terms and conditions prior to bidding on property. The act of submitting a bid shall constitute Bidder acceptance of each and every term and condition contained herein, any additional terms and conditions posted with the property, and any changes made within the full agreement.PAYMENT: All purchases are to be ?PAID IN FULL? U.S. Funds on Sale Day. Company or Personal Checks, Wire Transfers and most Credit Cards will be accepted as payment. Bank wires and company or personal checks will be accepted provided they are accompanied by a ?BANK LETTER OF GUARANTEE? guaranteeing payment. The buyer waives the right to stop payment on any check or monies given as payment. The Auctioneer reserves the right to hold any purchases until all funds have cleared the Auctioneer?s Bank and to hold ALL purchases on partial payment. REGISTRATION: All Buyers and Bidders must provide proper identification and register and receive a bidder number at each auction. Anyone bidding on behalf of a third party must also register to bid and will be held responsible and liable for all purchases. Buyers names are to remain confidential. The Auctioneer reserves the right to refuse any person a bidder number and may revoke the bidders? privileges at any time. SALES TAX: Buyer agrees to pay all applicable sales tax on all purchases, unless the buyer provides proof of exemption that is issued by the appropriate state or local Government Agency. Buyers must meet exemption requirements of the state or local Government Agency at the location in which the auction is held. Buyer also agrees to pay any sales tax that may be assessed after payment has been received.NO WARRANTY/DISCLOSURES: All Sales are made and accepted ?AS IS, WHERE IS, WITH ALL FAULTS? and without warranty or guarantee of any kind, either written, expressed or implied, as to merchantability or fitness for a particular purpose or otherwise. There are no warranties or guarantees as to year, make, model, serial number, condition, performance, and/or dotting & numbering, and/or digital slide production. All items are listed as accurately as possible and information is derived from sources deemed reliable. However, Buyer must inspect all items personally and accept with any faults or defects. Buyer in no way holds Auctioneer or Seller responsible for any defects, inaccuracies or errors in any way. All announcements sale day supersede any printed material. Your bid indicates you have previously inspected the lot and you know what you are bidding on. The Seller does have the right to make the final bid. 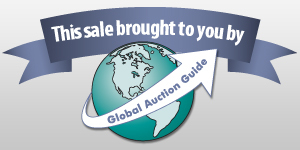 The Auctioneer reserves the right, but has no obligation, to bid on behalf of the seller. Auctioneer reserves the right to withdraw, add or group the property from an auction. AUCTION SITE: All Persons attending, inspecting or removing property assume all risks whatsoever of damage or loss to person and property and specifically release the Auctioneer from all liability. Bidder agrees the auction site is potentially dangerous because of heavy equipment operation. Regardless of cause, Auctioneer or its agents will not be responsible for any injury to anyone at the auction site. TITLES: Titles are not available on sale day and will be mailed to all out of state purchasers approximately 30 days after satisfactory settlement. No titles will be available if vehicles are marked ?No Title?. Title and Document Fee on all vehicles under 11,000 lbs are $75.00. Title and document fee on trailers are $50.00. Texas Residents Only will be charged for registration fee of $125.00. Buyer will need to provide driver's license and proof of insurance before removal of any titled item, vehicles with titles will be transferred within two weeks, it could take at least another 3-4 weeks to receive the actual title from the state. All titled purchases will be assigned to the name on the invoice. Changes can only be made during the payment process. Title transfer process will not move forward without all the proper documents. BUYER?S PREMIUM: All purchases will incur a buyer?s premium of five percent (5%) for on site bidders and eight percent (8%) for internet bidders, which will be added to the winning bid amount. ONLINE BIDDING: In the event of a tie bid, floor bidders always take precedence. Auctioneer accepts no liability for any failure or delay in executing bids or any errors contained in bids via the online bidding service.REMOVAL OF ITEMS: All items must be removed form the auction site within 15 business days after the auction. After 15 business days, there will be a $5.00 storage fee per day, per lot. Announcement:Information contained herein is presented on behalf of the seller. Iron Bound Solutions, agent for the seller, cannot guarantee the information to be correct or assume the liabilities for errors and omissions. All lines drawn on maps are approximate. Buyers should verify the information to their own satisfaction. Any announcements made from the auction block on day of auction will take precedence over any matter of print and will be final. (3) External Lineup Clamps (1) 30?? (2) 16?? 2) Elevator Links 16ft x 2 3/4?? 350 Ton. (2) Elevator Links 16ft x 2 3/4?? 350 Ton. Norstar Utility Bed, 112" Long, 91" Wide.